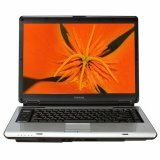 70% Toshiba holds back the Satellite A135-S4499 with mediocre components. There's a lot to like about the Toshiba Satellite A135-S4499 ($1,499). It looks great, comes with dual 120GB hard drives (loaded with Windows Vista Ultimate) and 2GB of RAM, and sports a slick Synaptics touchpad that moves the cursor and does a whole lot more. Unfortunately, it needs a faster processor and graphics to make it really shine. Because of its sleek design, hardware extras, and good display and sound, we recommend the Toshiba Satellite A135-S4499. It's just not the best mainstream machine of the money.